Mark your calendars and save the date — July 6th is set to be our only long table event of the year! We’re thrilled to have the talented team behind Restaurant 62 serving up a family-style dinner to our guests. Join us as we bring the community together over local food, live music, and a great time. Details including the menu and ticket sales will be release soon so keep an eye out for their release. 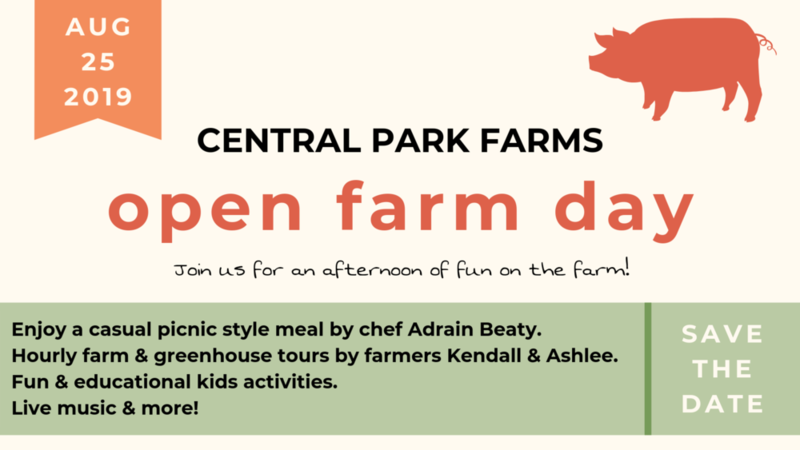 Join Farmer Kendall from Central Park Farms and Farmer Ashlee of Inner Peas Market Garden for a fun-filled, family day on the farm! Bring your lawn chairs and picnic blankets and get comfy in our field and enjoy a casual meal by Chef Adrian Beaty while your kids take part in hands on activities to help them connect with where their food comes from. We'll have live music to entertain and hourly tours of our farm with Kendall introducing you to the animals of Central Park Farms and Ashlee giving you a look inside the greenhouse where she'll be growing her produce this year. If you've been hoping to tour the farm this year, this is your chance! Grass Fed Beef Burger: Topped with house smoked Central Park Farms bacon and Golden Ears cheese on toasted brioche. Burger toppings inspired by and created with fresh produce. Served with pork fat pan fries and aioli. Lemon Herb Chicken Salad: Enjoy a seasonal salad of Inner Peas' produce topped with a Central Park Farms egg and lemon herb brined chicken. Served with fresh herb vinaigrette and grilled fresh focaccia bread. Additional items will be available for sale at the event including dessert, drinks, and extra hot dogs for the young, and young at heart. Tickets will be released shortly, so check back to get yours. If you’ve been wanting to be able to pop in to shop for your favourite free range and pasture raised meat now’s your chance. It's all about bacon makin' in this workshop! We’ll walk you through the process of curing and smoking Central Park Farms pork. We'll be preparing 2 varieties of smoked bacon -- a honey cured and a beer brined bacon! Then we’ll move on to pancetta, the Italian style bacon were the belly is cured, rolled and hung. Keeping with the Italian theme, we’ll go through the process of making guanciale, a style of cured jowl bacon. Finally Canadian bacon -- the maple cured loin. We’ll discuss safety procedures, different curing and smoking techniques, and of course a sample of everything that is made. Everyone will also get a package of what was made to take home! Join us and learn how to craft beautiful charcuterie that will be sure to impress your guests this holiday season! The perfect addition to any holiday party or simply a fun evening of wine with friends, charcuterie is becoming so popular and for good reason -- It's delicious! Everyone goes home with a sample of each item to enjoy at home! 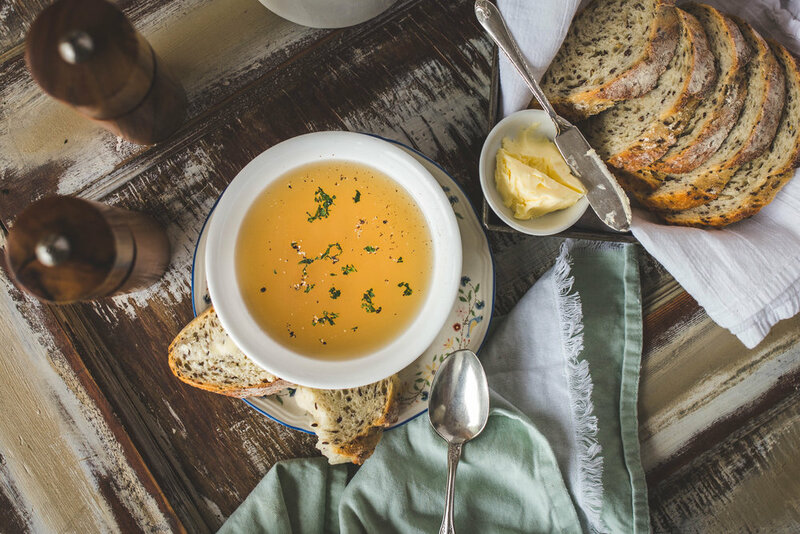 We've been hearing all about the health benefits of quality bone broth, but do you know how to make it at home? Get the inside scoop from Chef Adrian! Learn all about the positive benefits of broth, how to make it, and recipes to use it in. We will go through the process of making chicken, beef, and pork bone broth, sampling each one. We will then demonstrate and serve a recipe using the bone broth -- It’s not just for drinking! Everyone will take home 1L of each broth made. Learn all the tips and tricks to make delicious sausages from scratch in your own home! This workshop will cover everything you need to know about the basic techniques of sausage making. We’ll discuss the importance of food safe practices while making sausage, where to source the ingredients, the “science” behind sausage making, and finally some great sausage recipes. Participants will have the opportunity to make sausage and taste all the sausages we make during the work shop. We will also use each sausage in a featured recipe that you will also have the opportunity to enjoy! Workshop tip...don't eat before you get here! Join Chef Adrian and he teaches you how to butchery a whole hog in this fully hands-on workshop. Everyone get the chance to work on the pig in this class! Class will start with a walk around the farm to see how the pigs are raised and treated. Working in groups of 4, you will break down the pig. We will be discussing the different cuts of pork and how they are they are prepared. We will also be discussing knife safety and proper sanitary practices. At the end of class everyone will go home with approx 15lbs of meat and recipes to go along with each. A small meal will be served at the end of the class. Have you ever wanted to learn how to make lard and how to use it in every day dishes? Now's your chance! We'll discuss the different ways to render out pork fat, the different types of fat, and demonstrate and enjoy a full menu surrounding pork fat. Everyone will take home a package of fat to render! Come join us for a local long table feast to celebrate to coming of Fall and the release of our grass finished beef! What better way to kick off the end of the summer season (or perhaps the kids going back to school... we won't judge!) than with our final long table event of the year?! Chicken, cooked over briquettes, with maple mustard glaze. Grass fed beef and ricotta meatballs with a roasted corn, sweet pepper, and mushroom sauce. A selection of seasonally inspired local vegetables, sautéed in butter, and finished with Vancouver Island sea salt. Basket of fresh breads with whipped butter. Maple glazed apple cake with cider creme for dessert. Included in your ticket price is your choice of a glass of local wine from one of our neighbouring vineyards or a craft beer from a local brewery. There will also be additional wine and beer for sale by the glass during the event with the proceeds going to the Nutrition Coupon Program through the BCAFM, helping those in need in our community have access to local, nutritious food. Guests will have a chance to tour the farm, visit with the animals, and then enjoy live music by none other than Coalmont Band, some competitive lawn games, a cold drink along with a delicious meal, then after dinner join us around the camp fire. Guests must be 19+ years of age. ID may be required at the event for liquor service. Please plan ahead for a safe ride home. Note there will be a photographer on site during the event. Please contact us if you wish to not be photographed. If you wish to pay by e-transfer or by cash please contact us to arrange at info@centralparkfarms.com or by phone at 604-728-2374. Please wear comfortable footwear as dinner will take place in one of our fields and guests will have a chance to interact with our animals. The Langley Community Farmers Market Society is excited to announce their 3rd Annual Gumboot Gala! The Gumboot Gala is our annual fundraiser, featuring a night of dinner and dancing to celebrate the bounty of our local farms. Funds raised will benefit the market in our programming, including our Food Recovery Program and the Nutrition Coupon Program. The 2018 Gumboot Gala is being hosted by our friends at Central Park Farms, providing a beautiful, outdoor backdrop for this year's festivities (complete with cows munching nearby, chickens scratching for their dinner, and a highly photogenic donkey!) Gumboot footwear is encouraged...but not necessary, despite the outdoor location. On the Menu! Chef Adrian Beaty - Food from the Farm will be preparing a farm-to-table FEAST that you will not forget, prepared with food donated by Langley Farmers' Market vendors. Stay tuned for the seasonal buffet style menu! Ticket price includes one local glass of beer, wine or cider. Cash bar will available on-site. The evening also features dancing to music by the Cole Peterson Band, a 50/50 draw and opportunities to win prizes hidden in our Gumboot flower planters...generously donated by Langley Farmers' Market vendors and supporting local businesses! End the night sitting around a campfire, sharing stories and creating memories. Join us for an evening of delicious local food, cold drinks, live music, and great times! What better way to kick off the summer season than with a good ol’ fashion pig roast?! Guests will have a chance to tour the farm, visit with the animals, and then enjoy live music, some competitive lawn games, a cold drink along with a delicious meal prepared by Chef Adrian Beaty — It’s our annual pig roast long table y’all!